The Holy Land feels nothing short of vast, layered with diverse religious and political stories, which I discovered at every turn of my journey. The small land area consisting of Jordan, Palestine and Israel, has so much historical significance and cultural wealth I found it difficult to immediately absorb it all. Jordan is named after the river where Jesus of Nazareth was baptized by John the Baptist and where the Israelites crossed into the Promised Land. 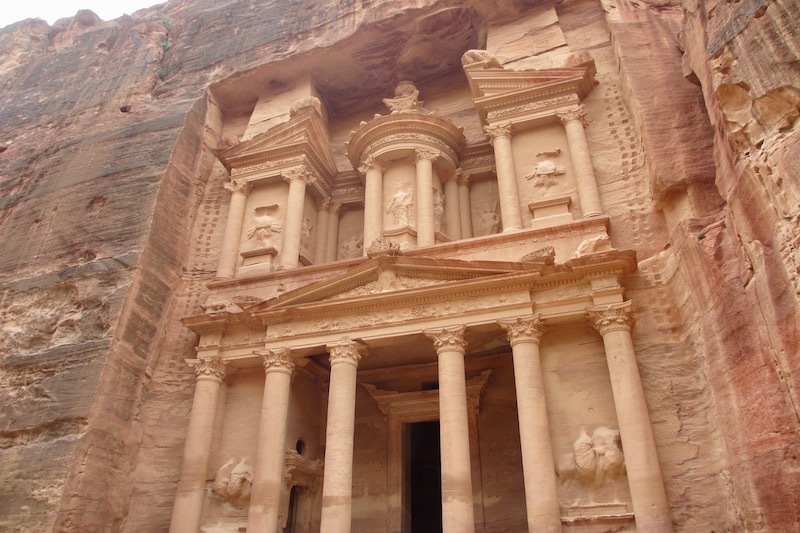 It has the iconic attraction of Petra, one of the New Seven Wonders of the World. I was stunned by the ‘Rose City’ just as visiting caravans must have been 2,000 years ago. Petra, once filled with 25,000 inhabitants at its peak, was a trade post established by the Nabataeans, a nomadic Bedouin tribe originating from current day Yemen. Amongst other prized spices and jewellery, the traditionally mobile community settled to trade Frankincense derived of tree sap from the Arabian Peninsula, which was used for its purification qualities. As I walked through the sandstone city, the blend of other cultures was evident to me as I observed its architecture. Petra’s location was a perfect spot for the Nabataeans to access the Mediterranean and to trade with Greeks, Assyrians, Romans, Byzantines, Egyptians, and Mesopotamians. Meanwhile, the classical Roman-Greco columns are ornated with horned Nabataean designs representing the thorny acacia bush commonly found in the local desert. The Temple of Winged Lions depicts the influence of Mesopotamia. It was easy to imagine Petra’s labyrinth once filled with residential quarters, roads, shrines, tombs, temples, pools, market places, water systems, and churches. Surrounded by vertical cliffs, Petra’s prominent and wealthy trade was incredibly defended by its natural topographical features. In fact, Petra was so impenetrable that it took the Romans several decades to conquer it. This became more clear as I walked through the high walled gorge that was the only traditional entrance point, later made internationally famous by the film Indiana Jones and The Last Crusade. However, Petra’s importance and other inland cities were not to last after several earthquakes took their toll and trade shifted to sea vessels by the 8th century. It is is incredible to think that just 20% of Petra has been excavated with many more mysteries remaining to be discovered – a wonderful reason to return once more! The Rose City of the Nabataeans, Petra, which they called Rekem. Petra is a Greek word that means ‘rock’. Hiking offers a unique and less crowded approach to Petra. My first glimpse of the city was through an alternative entrance near the monastery. This experience is only accessible by hiking a trail that I fully recommend. 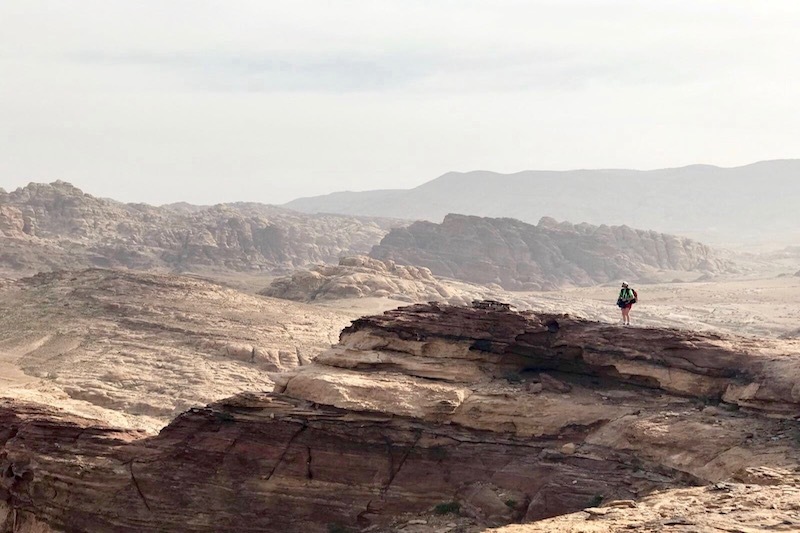 Being an adventure enthusiast, I could not resist hiking and cycling the Dana Nature Reserve to Petra route (80km, 5 nights hiking), which is now part of the Jordan Trail. 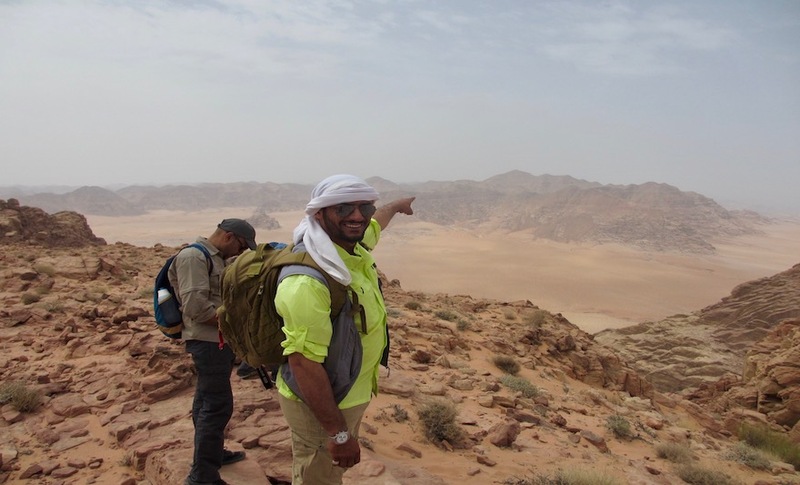 The Jordan Trail, a total of 600km in length, offered a perfect way for me to explore the country’s lesser visited sites and communities across the country. The Jordan Tourism Board has also launched the Meaningful Travel Map, a wonderful initiative listing the cooperative associations and social enterprises that are leaders in sustainable tourism. They offered me beacons to follow as I desired to explore further off-chart! Epic landscapes across the Great Rift Valley along The Jordan Trail. A personal highlight of my adventure was the national park of Wadi Rum, meaning ‘Valley of Heights’. This is where the epic Lawrence of Arabia was filmed as well as The Martian, Star Trek Discovery, Prometheus, and Star Wars Rogue One. Sleeping overnight in its other-worldly terrain was an experience not to be missed. I was captured by Bedouin tales over a camp fire after enjoying a traditional Zarb meal that was cooked in the sand for three hours. Our Jordanian guide, Nad, overlooking Wadi Rum national park. Nad is wearing a Hatta, which is used for many purposes not least as protection from the sun. The Hatta is tied with a rope additionally used for tying horses and as a whip. Just when I thought the hospitality, food, and warmth of Jordanians could not be surpassed, I entered the West Bank, a Palestinian territory, to hike the Masar Ibrahim Al-Khalil, otherwise known as The Abraham Path. 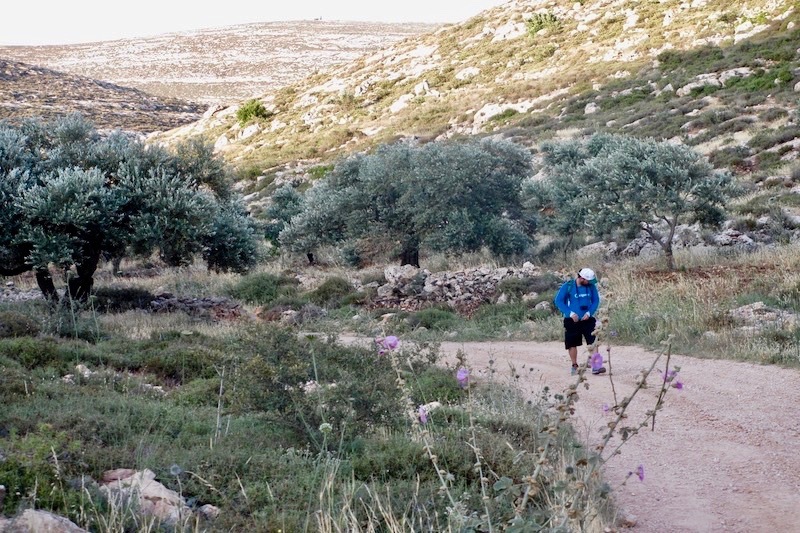 The trail extends 330km crossing fields of pomegranate, jasmine, fig, date, and olive trees. It took me through charming villages with clues of their 10,000 year old past, including Sebastian, where the tomb of John the Baptist (prophet Yahya in Islam) can be found. I stayed in Taybeh, the last all-Christian community in West Bank, where I visited a local brewery and vineyard. Another highlight of the trail was walking through Wadi al’Auja, meaning zig zag. Its canyons were shadowed by the silhouette of flying raptors and dotted with caves where valuable wild honey is collected, before walking through the cobbled streets of Bethlehem, the birthplace of Jesus. The Abraham Trail crosses Palestine’s ancient landscapes, spiritually significant to so many. Visiting Jerusalem transfixed me in a state of awe by its buzzing markets, religious diversity, and acts of faith. Such is the sacred and biblical nature of this land, sieges and conquests were fought by many, including the Canaanites, Israelites, Romans, Crusaders, and Ottomans just to name a few. 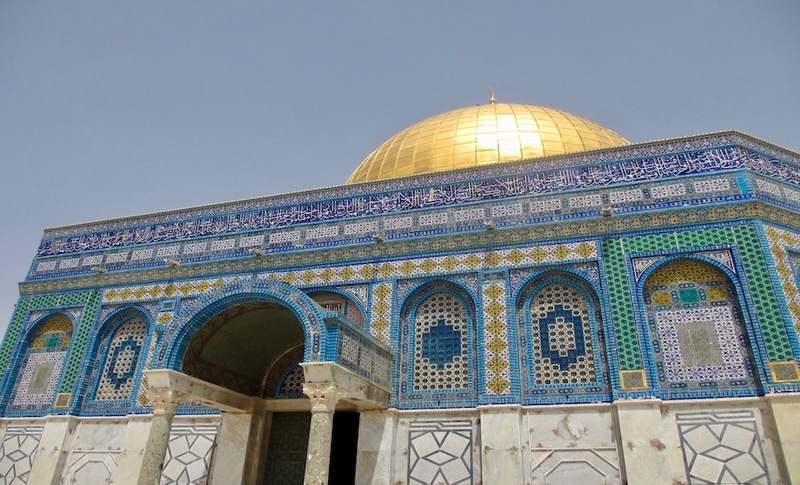 The octagonally shaped Dome of the Rock is Islam’s third most holy mosque, Al Aqsa, where Muslims believe the prophet Mohammad began his ascent to heaven. The city of Jericho is also known as the City of the Moon because of the Canaanites’ worship of the moon god. It was born 12,000 years ago around a freshwater spring making it the world’s oldest continuously inhabited city. Today, Jericho is the food basket of the West Bank and famous for its small, tasty bananas. Cycling around the city I was able to visit the 2000 year old ruins of King Herod’s Palace, with the largest surviving mosaic of the ancient world. It is also where the particularly special Tree of Life mosaic can be found, which portrays symbolism of the duality of life – good and evil, peace and war – a symbol that remains so profoundly relevant to the region’s political situation today. Just a few minutes cycle away, I viewed the Mount of Temptation where Jesus prayed after being tempted by the devil. Judaism, Christianity, and Islam are Abrahamic religions. All are Semitic-originated communities of faith that worship the God of Abraham and claim descent from the ancient Israelites. Beyond the horror I felt upon seeing the ever-growing wall that divides the West Bank, the whole journey through the Holy Land only highlighted to me how much we all have in common; how civilisations are simply a transient tapestry of ancestry and culture that frequently share the same heritage and even dreams. Most desire a life filled with peace and kindness.